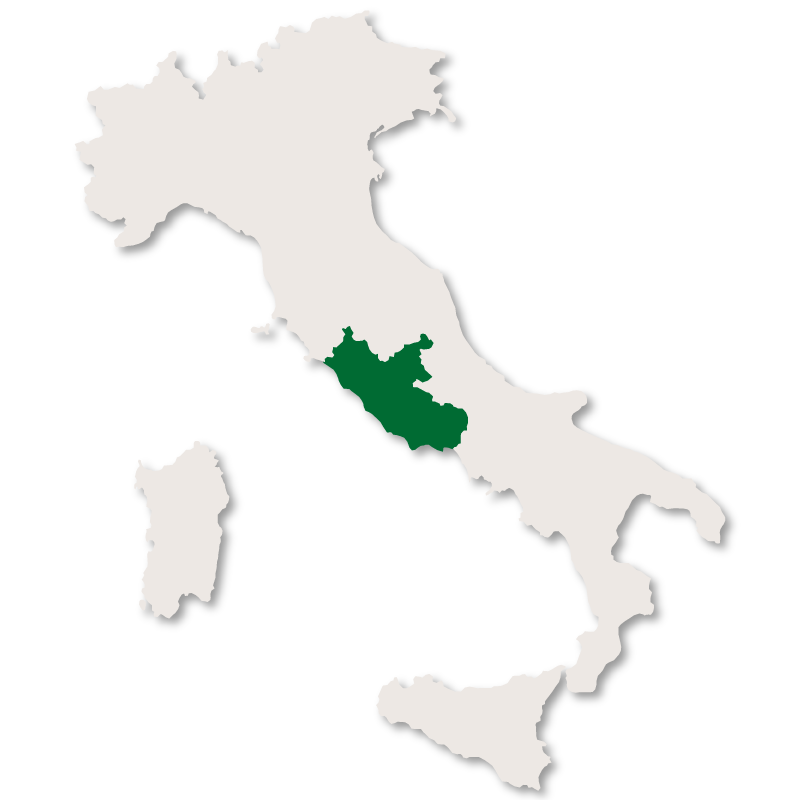 The province of Viterbo has an area of 3,612 sq.km and is bordered to the north by the region of Tuscany, to the north east by the region of Umbria and the province of Rieti, to the south by the province of Roma and to the west by the Tyrrhenian Sea. 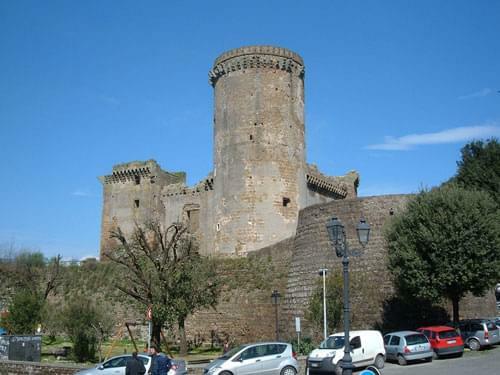 The area is also unofficially, but quite commonly, known as Tuscia. It is a fertile, green province which is dotted with pretty little medieval villages steeped in history and tradition. The terrain is volcanic with fertile soil and lakes which have formed in old craters. 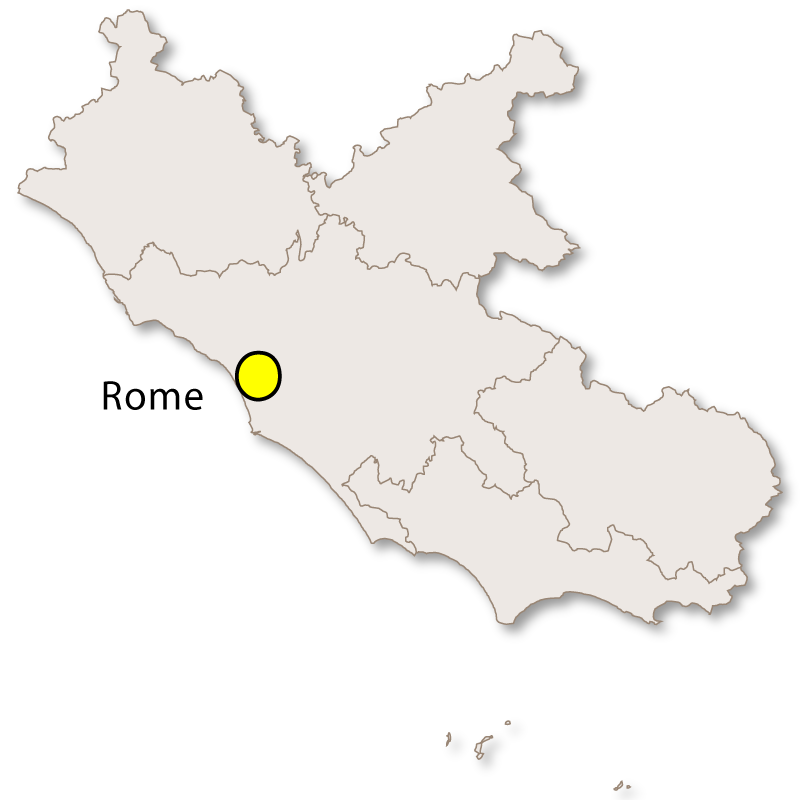 It is fairly flat in the north but then becomes more hilly before reaching the Cimini Mountain Range. The coastline is pretty with sandy beaches and clear water. 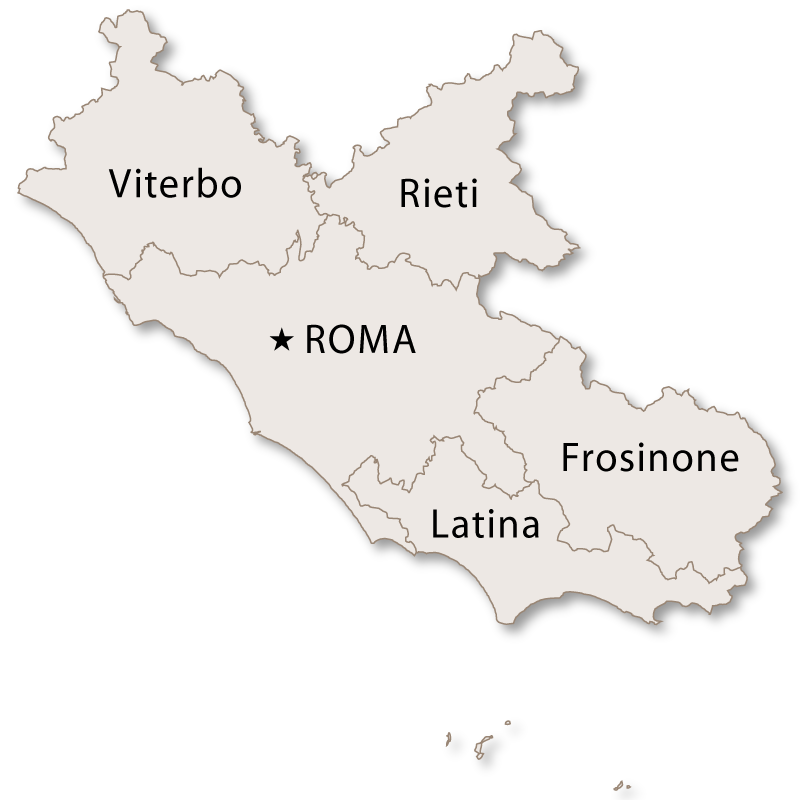 The city of Viterbo is the capital of the province of Viterbo in the region of Lazio. The historic centre is surrounded by well preserved 11th century medieval walls with access to the old centre gained through one of several ancient gates. 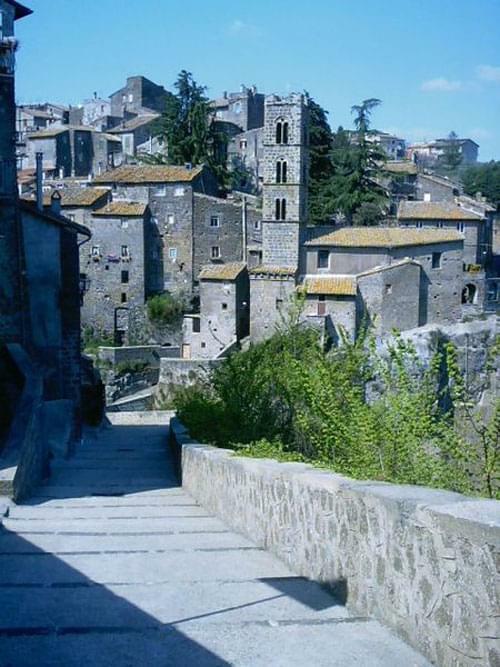 This is one of the best preserved medieval towns in central Italy. 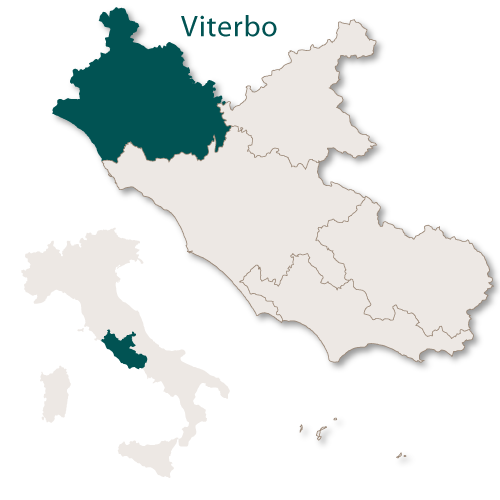 Viterbo has a good industry in the production of goods made from marble, wood and pottery and is the city where the Italian gold reserves are kept. 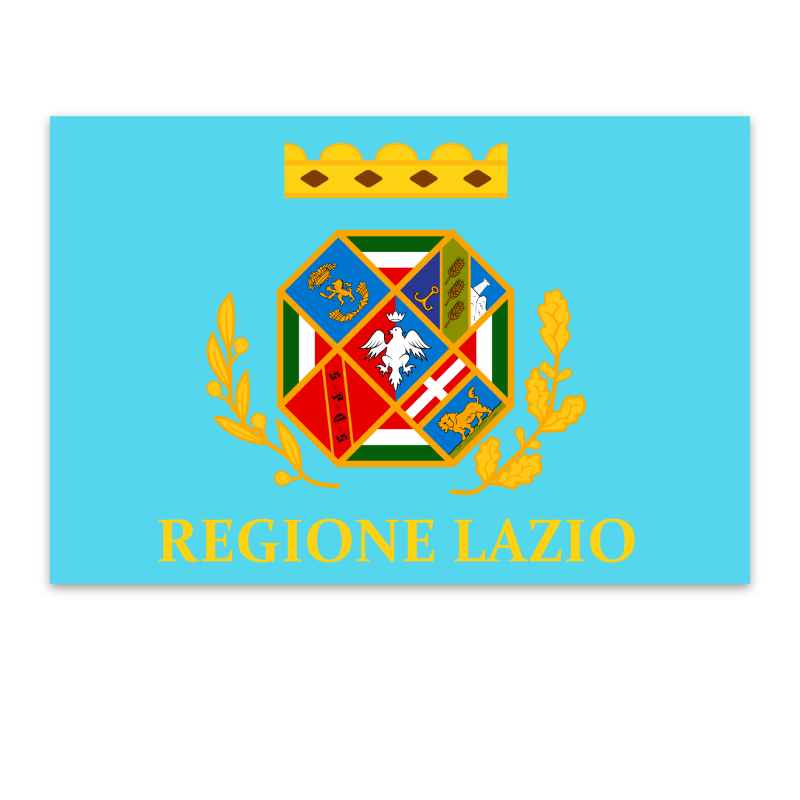 It also has the University of Tuscia, an Academy of Fine Arts and is home to the the Italian Army's Aviation Coammand headquarters and training centre. Palazzo dei Papi is one of the major attraction in Viterbo as it was the papal seat for 24 years between 1257 and 1281. The Cathedral of San Lorenzo was originally built in the Romanesque style but was rebuilt several times from the 16th century onwards, particularly after being heavily bombed in 1944. Palazzo Farnese was built in the late 14th, early 15th century and was the childhood home of Alessandro Farnese who in later life became Pope Paul III. Palazzo degli Alessandri is a medieval patrician house right in the centre of the city. Chiesa del Gesù was built in the Romanesque style during the 11th century. Santa Maria della Salute is a small Gothic church with an ornate portal. The Sanctuary of Santa Rosa is a 19th century church with a dedicatory tower in front of it. This tower is replaced by a new one every year. Fontana Grande is a public fountain which was constructed at the beginning of the 13th century. Museo Civico is the City Musuem and has a good archeological section with many items for pre-historic to Ancient Roman times. 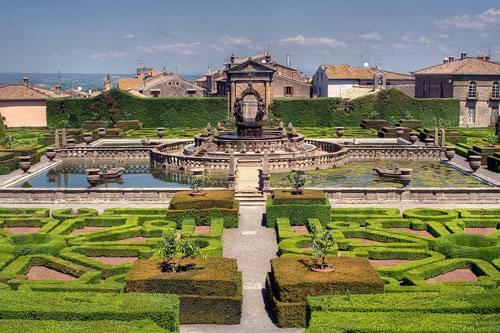 Not far from the city of Viterbo is the small town of Bagnaia where you can find the little known but stunning Villa Lante and its Mannerist garden. The main feature of this garden is water and all around there is a spectacular choreography of waterfalls, fountains, lakes and gently dripping caves. During World War II this village was severely damaged when a train loaded with German munitions blew up at the station and destroyed all the rooves and walls and of the old hamlet. This meant that there was a mass evacuation of the area and it remained uninhabited for many decades. There has recently been a recovery programme and over thirty houses have so far been fully restored. 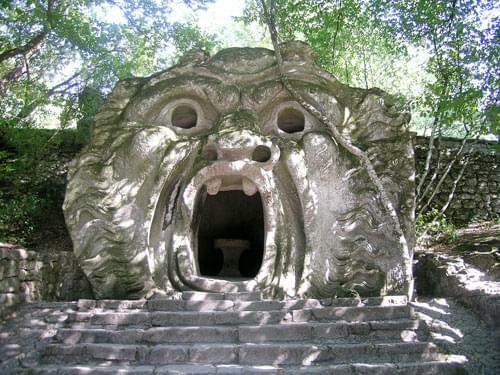 The main attraction here is the garden called Bosco Sacro and nicknamed 'Bosco dei Mostri' meaning 'Woods of the Monsters'. It has earned this name due to the large sculptures, mainly carved from bedrock, which preside over this rather bare landscape. This rather strange park was created between 1528 abd 1588 by Pier Francesco Orsini after his wife died and most of the work is attributed to Pirro Ligorio. It was certainly not created to be pleasing but more to shock but there is no explanation to be found as to why. The bizarre nature of the park appealed greatly to Salvador Dali and inspired many other surrealist artists. It certainly makes a very different and fun day out which is usually enjoyed greatly by children. There are the remains of amphitheatre here measuring 49 metres by 40 metres as well as the remains of the city walls. The most interesting site to visit in Sutri has to be the church of Madonna del Parto which is cut out of the cliffs facing the town. 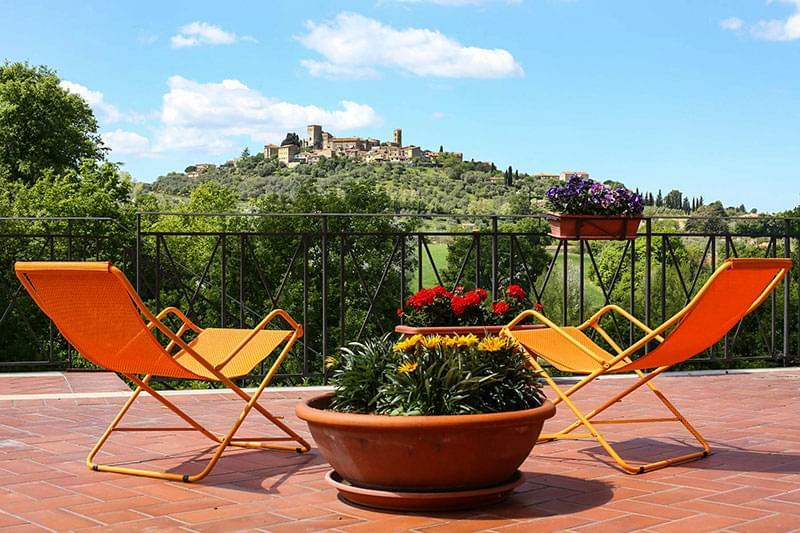 Sitting on top of hill overlooking the Sutri valley and at the feet of the two extinct volcanoes Cimini and Sabatini, this village has a very volcanic prospect with hills, wooded valleys, deep rivers and hot springs. The medieval centre is in excellent condition and Federico Fellini shot part of his famous film 'La Dolce Vita' here. 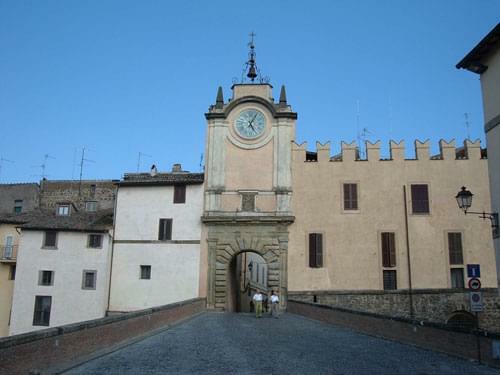 Anguillara Torrione Castle with its interesting and unusual Porta and Ponte dell'Orologio (clock bridge). Chiesa San Pietro, built in the 9th century. Chiesa San Francesco, built in the 13th century with Michelangleo style fresoes. Palazzo Accoramboni built in the 17th century and is now the seat of local administration. Palazzo Montenero-Sansoni, constructed during the latter half of the 18th century by Charles Thierry, a French doctor. It was built as a sanatorium to undertake medical treatments with the local mineral waters. 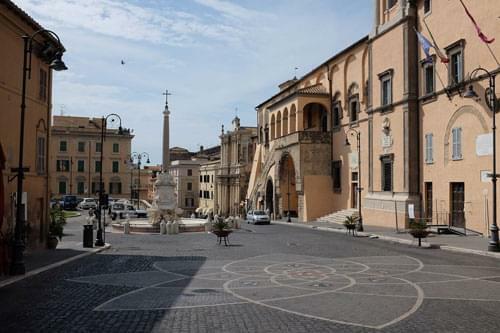 This is another town which is renowned for its mineral waters and here it is sold, bottled and distributed throughout Italy as drinking water under the name of Acqua di Nepi. A Borgia Castle which is a 15th century reconstruction of a feudal manor and once belonged to Lucrezia Borgia. The castle has enormous walls and four towers, one of which is open to the public. 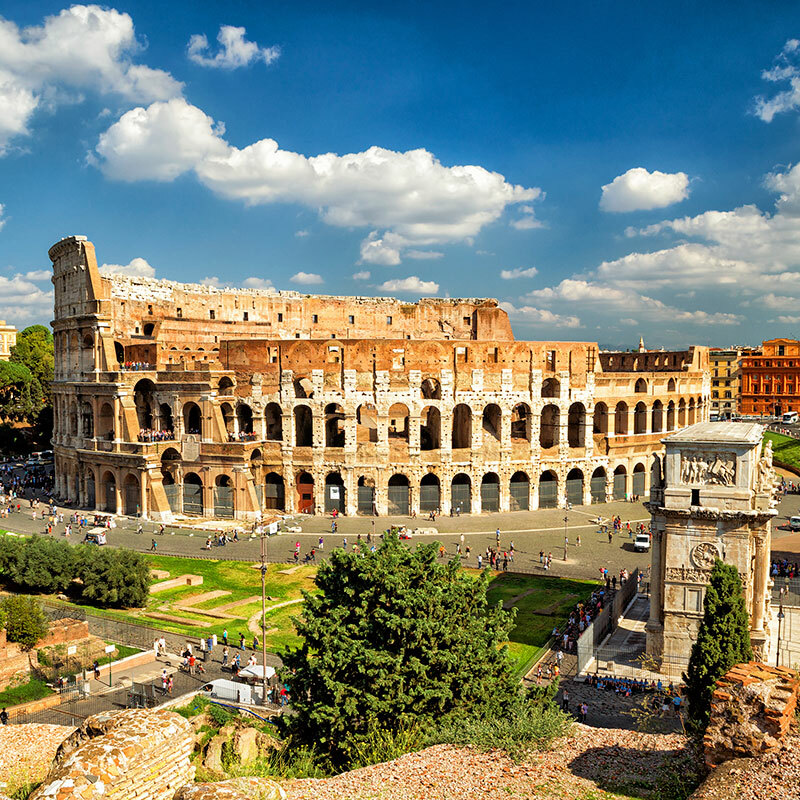 The Cathedral of the Assunta was built in the 12th century over the top of the ruins of a pagan temple. It was set on fire by French troops during the Napoleonic Wars but was rebuilt in 1831. The Town Hall was designed in the 15th century but the building of it was not compeleted until the 18th century. The Santa Savinilla Catacombs believed to be from the year 800 B.C. Located in the Cimini mountains, roncigliione is considered to be one of the most beautiful medieval burgs in central Italy. The Castle which was build in the middle ages. The Cathedral with a bell tower from 1734. The Church of Santa Maria Providenza was built in the 11th century and later restored in the Baroque style. The remains of the Church of St. Andrew, built in the 12th century. Villa Lina which has large botanical gardens and is currently run as a luxury Bed and Breakfast. Both a DOC red wine and a white frizzante wine are both produced here. The medieval walls are still intact and there are also many medieval towers. The Etruscan necropolises which have around six thousand tombs with at least two hundred of them including well preserved wall paintings. The Palazzo dei Priori with a massive external staircase and fresoes inside from 1429. 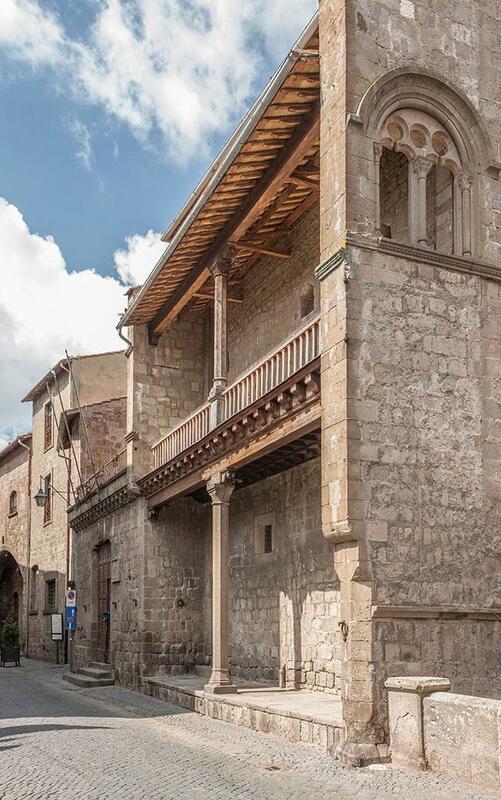 The Town Hall which was built in the 13th century in the Romanesque style and restored in the 16th century. The Church of Santa Maria di Castello, built in the 12th century it has a small bell tower and three separate entrances. The Church of San Giacomo and Santissima Annunziate which has both Byzantine and Arab influences. The tiny church of San Martino built in the 12th century.